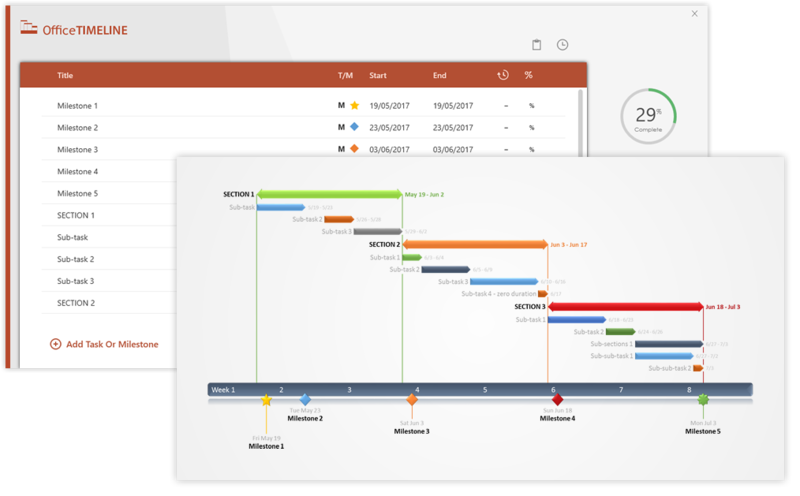 Gantt charts are powerful planning tools as they show activities or tasks and their corresponding timeframes in a simple visual format, making it easy to see the big picture at a glance, coordinate work, and track progress. Professionals who wish to communicate their plans and schedules through a Gantt chart don’t need to install complex applications to create one. They can use the office software they’re already familiar with, as most of the “standard-issue” productivity tools have functions that can help create such visuals. Depending on the software you use, making a clear, eye-catching Gantt chart that anyone can follow may be quite a laborious process. To help professionals get started faster, this page provides a series of tutorials that explain the exact steps to creating Gantt charts with the most popular office tools. Browse through the page to get an overview of the guides and resources available for each tool, or use the menu above to go straight to the tutorial you’re interested in. One of the most commonly used tools for presentations to high-level audiences, PowerPoint can prove useful for making Gantt charts as well. Although it doesn’t have a built-in Gantt feature, the program does allow you to create such a graphic by formatting a Stacked Bar chart. Click below to see exactly how to do so. Professionals who use Microsoft Excel to keep track of their tasks or activities can use the tool’s Bar Chart feature to convert their data table into a Gantt. See a detailed Excel Gantt chart tutorial that explains all the steps involved in building the graphic and formatting it to look clean and easy to follow. Primarily designed for editing copy, Microsoft Word does have some graphic tools too that enable users to create basic Gantt charts and other visuals. This step-by-step tutorial explains how to build a Gantt chart in Word using the tool’s Stacked Bar feature, along with some customization tips to make the graphic stand out more. 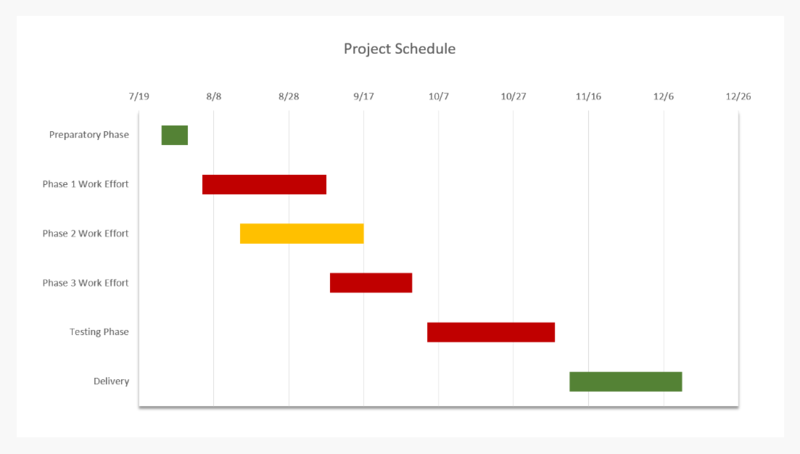 Microsoft Project has a Gantt Chart View feature that automatically turns task lists into Gantt charts. Although powerful planning tools, these visuals are often too complex and difficult for audiences to understand. This tutorial explains how to make a clear, easy-to-follow Gantt chart in MS Project and prepare it for client presentations or executive meetings. Easily accessible from anywhere, Google Docs is useful for planning small to mid-size projects and collaborating with teams. Although the online tool doesn’t have a built-in Gantt feature, it is possible to create a Gantt chart within your Google spreadsheet by using a Stacked Bar Graph and a bit of formatting. Click the link below to see the exact steps. Mac users who manage their plans and schedules in Apple's Numbers can turn their data table into a Gantt chart by tweaking the tool's 2D Stacked Bar feature. See exactly how to set up and format the graphic in this detailed Numbers Gantt chart tutorial. The guide includes customization tips as well, along with a downloadable Gantt template for Mac. Keynote is popular for making it easy to create eye-catching presentations. However, it might not be as intuitive when it comes to building Gantt charts, which don't come as a default feature in the app. 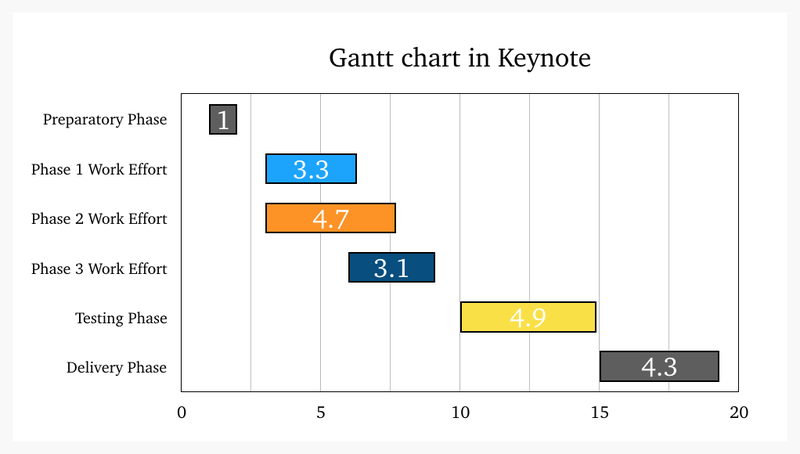 This step-by-step tutorial will show you how to make a Gantt graphic in Keynote starting from one of the built-in chart types available in the presentation tool for Mac. Mac users who wish to liven up their Pages documents can easily insert several kinds of charts and diagrams using the word processor's controls. Creating a Gantt chart is not very difficult either, but it does require a bit more effort than the default visuals available in the tool. This tutorial explains the steps involved in building and customizing a Pages Gantt chart. For important presentations, professionals can use a PowerPoint Gantt chart maker to build eye-catching visuals in minutes. 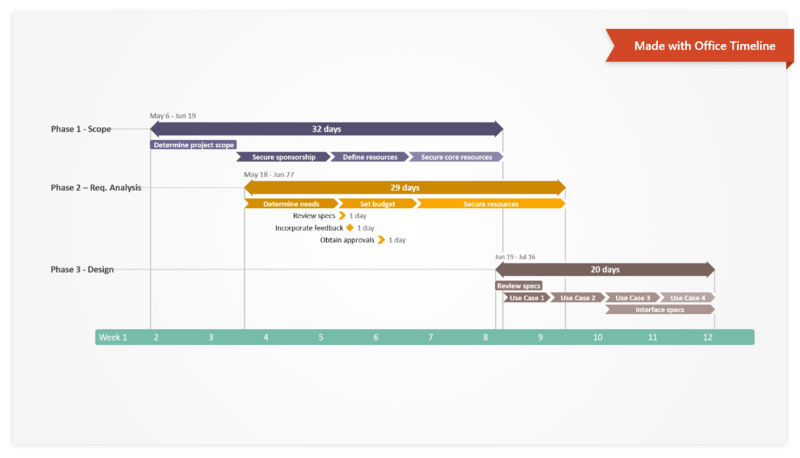 The Office Timeline PowerPoint plug-in integrates with popular office tools to instantly turn raw data into Gantt chart slides and update them automatically. I am constantly required to provide executive-level views of project plans in an uncomplicated way. Office Timeline Plus makes vibrant, easy to understand Gantt charts, and the import and sync functionality make it a must-have application in my project toolkit.